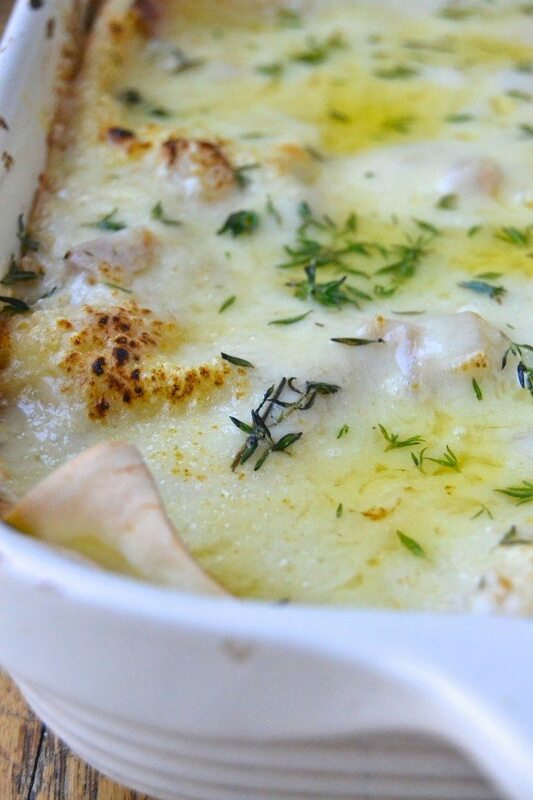 White Mushroom Lasagna is a rich, comforting lasagna infused with fall flavors like mushroom, shallot, thyme, Gruyere and Marsala ~ it's very luscious. Dust off your mushrooms and trim just the very ends off the stems. Slice them thickly. Reconstitute your dried mushrooms according to the package directions, then drain and rinse. Give them a rough chop and set aside. Heat a large saute pan on medium high heat and saute the mushrooms, and about half of the fresh thyme leaves, in batches, stirring constantly until they have begun to lose their moisture and are nice and fragrant and browned. Don't use any oil or butter --- the heat of the pan will saute them and concentrate their flavors. No mushy mushrooms! I did my sauteing in three batches so as not to crowd the pan. It doesn't take long, just several minutes per batch. Put the mushrooms aside on a plate, along with the reconstituted dried mushrooms. In the same pan heat the olive oil and butter and saute the shallots for a few minutes. Add the Marsala and let it bubble for a minute, scraping anything up from the bottom of the pan. When the liquid has reduced, sprinkle the flour over the shallots and stir to combine. Stir for another minute. Combine the milk and half and half and add it to the pan in a stream, stirring constantly. Whisk or stir to combine everything well, and then cook until the sauce thickens. This will happen just as the temperature is coming to a boil, but don't let it boil. Turn off the heat and add the grated cheddar cheese. Sprinkle the Parmesan cheese in and stir to melt it, too. If the sauce seems too thick, add a little more milk. Taste it and season with salt and pepper as necessary. To layer your lasagna: Spoon a little of the sauce across the bottom of a 9x13 casserole. Lay down a layer of pasta. Scatter 1/3 of the mushrooms across the top. Then 1/3 of the ricotta cheese, then 1/4 of the sauce. Add another layer of pasta, and repeat. When you get to the top layer of pasta, you will be adding the remaining sauce. Spread evenly over the entire top. Then add the Gruyere cheese evenly sprinkled over the sauce. Cover loosely with foil, so it doesn't touch the cheese, and bake for about 40 minutes, or until everything is bubbling and hot throughout. Pop it under the broiler for a minute if you want to get some color on the top. Scatter the remaining fresh thyme over the top and serve.